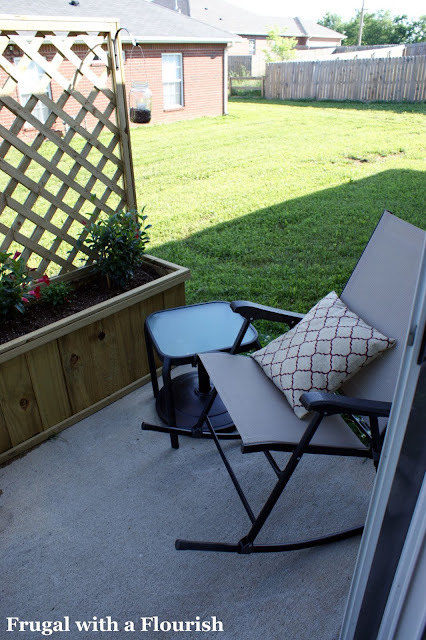 Frugal with a Flourish: My Patio Book Nook Transformation! oh my gosh, i love it. you had great design ideas here, for sure. you made the space feel bigger, private, and comfortable. can't believe it's the same cement slab snore! It looks fantastic!!! Great job!! What a nice little corner to getaway to! That is so adorable, I love what you did, now we have atmosphere galore!!! You did such a great job with such a little space! I'm anxious to see how that vine does, as I want some kind of vine, too. Very nice! I've never been able to get a vine to actually climb what I want it to. That's going to be so pretty! What a great use of space ! Looks like a perfect place to sit with a glass of lemonade and a good book - Enjoy ! I cannot believe the after. You did a great job!! I need to get out in the dreary back yard now and make it look alive. It looks very inviting. I love it! This is a special place indeed-congrats! Love the planters! Great job I love the color of the flowers and the candles in Coffee look so cool! That looks amazing. Seriously amazing! A lil oasis! It's a comfy, lovely space now. Well done! Those mason jar lanterns are so cute too. Are those coffee beans the votives are sitting on? Very inviting! Enjoy your summer. And I suggest Carrie Diaries if you have ever been a SATC fan or Shadow of Your Smile by Mary Higgins Clark! Very, very nice. It's a beautiful space and looks like a wonderful peaceful place to read. Enjoy it! I think Mandevilla climbs and comes back every year- you chose well! Lovely, just lovely! I can see why your neighbors would be jealous! Great job on all the color, texture and details. Love, love the built-in flower box. oooh, love those lattice planter boxes. Very clever! This looks GREAT! What a great place to go for some time alone! LOVE IT! This looks awesome! Love that rocker, where'd you get it and how much was it? Fabulous! Love those planters. No wonder the neighbors are jealous, I'm jealous too! Very nice. Good job transforming a small unattractive space into something beautiful. so smart!! I have an indoor reading area in my covered two-season patio. I think I'll use this to make my little spot more comfy and pretty. Thanks for the idea seeds!! This is a terrific idea, Jess! It's no wonder why your neighbors are jealous. LOL! Seriously, you transformed it into a relaxing reading spot, plus that rocking chair. Amazing! That fence around your patio is absolutely stunning. What a great idea! It’s like having your own little corner of the world. It’s private and intimate, yet open to nature. Great job with your patio!